The synthetic diamond machine-turned-high pressure laboratory. 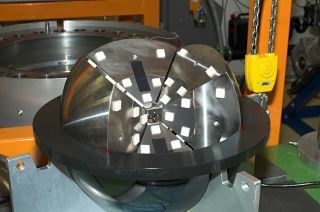 Steel anvils surround a cube made of diamond-infused wedges, which can crush a sample to pressures found in Mars'core. Above ground,Mars is mostly a bone-chilling desert pocked with craters. Hundreds of milesbelow, however, a molten sea of iron, nickel and sulfur churns. And newresearch suggests the gooey corewill eventually solidify?either from the outside-in, forming an iron-nickelcore, or from the inside out, forming a core of a fool?s-gold-like minerals. AndrewStewart, a planetary geochemist at the Swiss Federal Institute of Technology, saidMars? cooling core might restoremagnetism to the red planet. ?If liquid metal moves around a solid core, itcould create a natural dynamo like the one found in Earth?s core,? saidStewart, who co-authored the study detailed in today?s online edition of thejournal Science. Liquidsturn solid at different temperatures when pressure or purity are changed?dryice, for example, is carbon dioxide gas squeezed under immense pressure. Addimpurities to ice, and its freezing point is lowered (which is why roads aresalted). Likewise, explained Stewart, sulfur mixes things up under Mars?crushing pressure of 5.8 million pounds per square inch. To simulatethe pressure at Mars? core, Stewart and his team used a synthetic diamond-makingmachine. Because the way Mars? entrails will freeze all depends on how muchsulfur is mixed in with iron and nickel, Stewart crushed samples with differentportions of sulfur. ?Mars? core is made of anywhere between 10 and 16 percentsulfur,? he told SPACE.com. ?It doesn?t sound like a significant range,but in a planet?s core it makes all the difference.? Afterdissecting the samples with microscopes, Stewart and his colleagues discoveredthat a low amount of sulfur would cause nickel and iron to solidify in chunks nearthe outer edge of the core, which would sink to the center. Deemed the ?snowingcore? model, Stewart thinks it?s the most likely scenario. ?On theother hand,? Stewart said, ?we found a heftier portion of sulfur would cause a fool?s-gold-likemineral to form in the center of Mars and grow outward.? Stewartsaid he?ll offer a better guess once the European Space Agency?s ExoMarsmission reaches the Red Planet in 2013 and the spacecraft's NetLanderprobes travel to Mars' surface. Designed to listen for Martian earthquakes and mapout the inside of Mars, Stewart said the newly gathered information will be ?theultimate test for whichof our conclusions is definitely wrong or definitely right,? Stewart said. ?Once we have seismic data from Mars, we?ll be able to know the sulfur contentand what?s going to happen to Mars? core. ?